"I had this in an Italian Restaurant close to home. This is my version. Make extra because these little treats disappear rather quickly." Preheat the oven's broiler. Brush the slices of bread lightly with olive oil, and place on a baking sheet. Toast under the broiler for about 3 minutes. Watch carefully. Rub each crostini with a garlic clove for flavor. Place the tomatoes into a medium bowl, and drizzle with olive oil. Season with salt and pepper. Place the crostini on a serving tray. 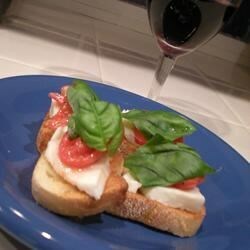 Top each one with a slice of mozzarella cheese, cover with a spoonful of tomatoes, and garnish with fresh basil. The flavor was very good. The bread was too hard to bite into to. I will try it again but with extremely fresh, softer bread. I don't really like bread broiled. So I mixed it all up, heaped it on the bread & cooked at 375 for 6-8 min. Perfect, thanks!